The premium quality hand-made Vitalwood Aspiro with the non-chemical treated latex, the wooden spring back support and the Cottonsafe cover from organic cotton and wool guarantees incomparable outstanding comfort and quality rest. 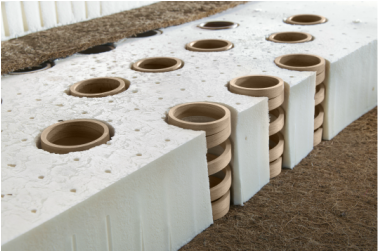 In addition to the electrosmog-free springs made from organic wood, the hand-made mattress incorporates numerous special materials. Besides the ventilating latex, natural cotton and wool, beneath the hand-stitched luxury mattress cover manufactured from natural wool and cotton with special Cottonsafe. A unique lined of wooden springs that are handmade from 100% natural compressed beech wood. 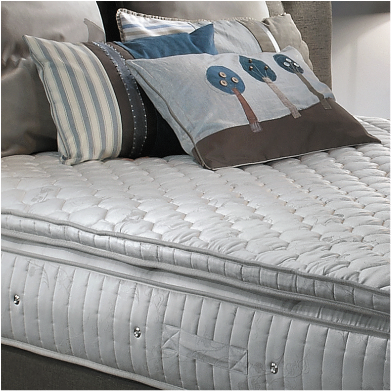 ﻿In the majority of beds with metal sprung mattresses, the springs behave as small magnets. Their fields push and pull each other at the same time. These fields can easily create uneven magnetic fields. Although the magnetic and electromagnetic radiation is invisible, their presence still causes unrest within our inner system. Researchers know this condition as "disturbed" sleep, which may result in blood supply, circulatory or metabolism problems, high blood pressure or increased excreta subsidence. VitalWOOD® mattresses use wooden coil springs instead of metal springs in order to provide an undisturbed environment for a truly peaceful rest! The base material for wooden coil springs is beech wood which is compressed and formed through a special process. The beech wooden coil springs, produced under a process unique throughout the world, regain their shape 100% even after 120.000 pressings, i.e. the simulation of 30 years use and guarantee a three times longer life span. Even more important is the advantage of not collecting and amplifying harmful radiation from the environment. At night the body requires deep, relaxing sleep. When you close your eyes, at first your heart rate and breathing slow down. The muscles still work similarly to the waking condition at this stage. In order to fall asleep, muscle tension must decrease and the support muscles running along the spine also need to relax. This is only possible if the role of these support muscles is taken over by your bed, which follows the shape of your spine, thus providing stable and flexible support to the body at each and every point. In addition to the wooden coil springs, the process by which the springs are incorporated into the mattresses also makes VitalWOOD® mattresses truly special. The innovation developed by us through the AWS (Anatomical Wooden Spring™) technology sees the distribution and arrangement of the wooden coil springs being based on anatomic considerations. The wooden coil springs embedded within a special shell-type structure are capable of independent movement and take the body weight evenly relieving the spine, thus enabling the revitalisation of discs and muscles. The temperature of our bodies is highest at around 9 p.m. and gradually decreases after falling asleep, rising upwards and returning to its normal value at around 5 a.m. As a consequence of these temperature changes the body generates 600-800 ml of moisture nightly. If the body is unable to decrease its core temperature or if you are too warm, too cold or your bed cannot divert the moisture, you will be unable to sleep well. 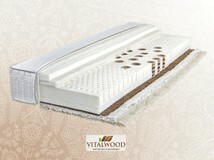 Due to the materials we use and the unique structural solutions VitalWOOD® mattresses breathe with you. We use carefully selected materials which adjust to your sleeping phases and are able to regulate temperature and moisture. In order to derive the maximum benefit from these intelligent materials, we considered internal ventilation as an important aspect during the development of our mattresses. VitalWOOD® mattresses take a breath with every movement: the air within the mattress bodies start to flow by compressing the wooden coil sprung inlay providing fast and continuous ventilation in the mattress by flowing through the ventilation channels which enmesh the body of the mattress. When you relax and fall asleep, your body remains motionless for lengthy periods of time. However, beneath the skin in the blood and lymphatic systems important processes are taking place. Much like a giant conveyor belt, useful and excess materials are transported through the vessels of the body. This process may drastically slow down or even come to a complete halt in a badly selected bed. In this case torpidity often appears to which you will respond by unintended tossing and turning. If this reoccurs several times during the night, your body will be unable to regenerate and you will awaken in the morning fatigued. Much like in your vessels, a two directional process takes place in the intelligent comfort layers beneath the cover of VitalWOOD®mattresses. The pressure created upon the mattress surface is directed away by the comfort layers towards the load bearing wooden coil sprung mattress core, which reacts with appropriate flexibility to the pressure. Regardless of your sleeping position, the VitalWOOD® mattresses perfectly map your bodyline irrespective of your body weight, and by eliminating the high pressure points, they provide free pathway for the metabolism and protect your sensitive joints. 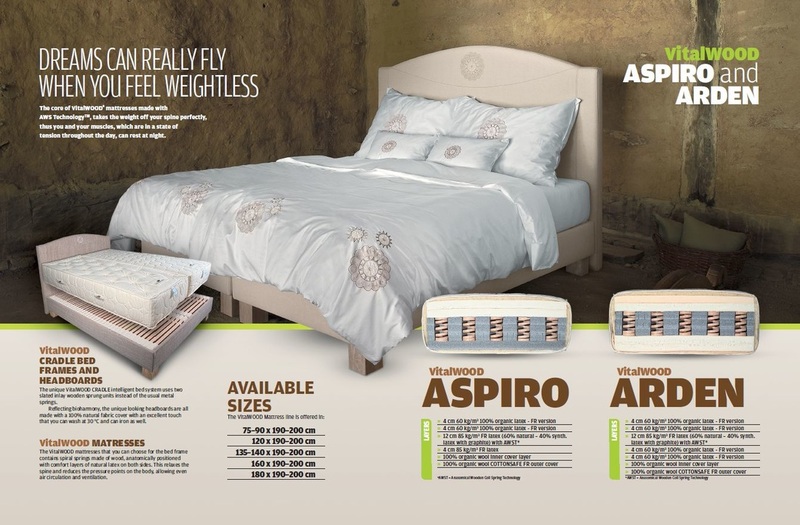 Would you like to try the Vitalwood Aspiro mattress with the AWS-Technology in our showroom? Our mattress showroom is based in South East London. Book an appointment now. Wood & Furniture Solutions Ltd. is the official partner of VitalWOOD® in the United Kingdom. All rights reserved Wood & Furniture Solutions LTD.